Much of the debate about the future of Zimbabwe’s agriculture has got stuck in the dualistic trap of contrasting ‘large-scale’ with ‘small-scale’, without thinking about the mix, and the relationships between them. In southern Africa with its colonial inheritance, this dichotomy is deeply entrenched. But with a new agrarian structure, there is a need to escape from this framing and think more creatively about opportunities and constraints. A recent paper by Rebecca Smalley, published by the Future Agricultures Consortium, and produced as part of the Land and Agricultural Commercialisation in Africa (LACA) programme, led by PLAAS, sheds some light from historical experience from across the continent. This review offers some important pointers for Zimbabwe, when we ask what forms of commercial agriculture makes sense today? Following land reform in Zimbabwe, there are farms of all sizes, although now dominated by a small-holder sector in the communal, old resettlement and A1 resettlement areas. However in addition there are A2 farms, largely medium scale operations of several hundred hectares in extent, and so-called large-scale A2 farms, that are larger. In addition there are existing estates that were untouched by land reform, including the large sugar estates in the lowveld of Masvingo. How then should we think of ‘large-scale commercial farming’ in contemporary Zimbabwe? How can a mix of farm types and sizes complement each other? And what lessons can we draw from elsewhere to inform this? Smalley offers a simple three-way classification of large scale commercial farming operations: plantations (or estates), contract farming (with and without a nucleus operation) and commercial farming blocks or areas. From a review of a vast literature, Smalley suggests that in general (but of course with huge variation), plantations grow one main cash crop; require capital investment; are larger than an average-sized holding; rely on hired resident or non-resident labour, often including migrant labour; and are centrally managed; and ownership may be foreign or domestic, private or corporate. By contrast in contract farming, farmers agree in a written or verbal contract to supply produce to a buyer, usually at a pre-determined price, on a specific date and to a certain quality. Within contract farming arrangements, there are several variants, including one that involves nucleus outgrowing, where contracted smallholders complement production on a central estate. Her third category is ‘commercial farming areas’, sometimes known as farming ‘blocks’. This involves multiple private commercial farms of medium or large scale that are more or less contiguous in an area. What are the findings in the literature on each of the three commercial farm types/configurations? The following paragraphs are adapted from the executive summary of the paper (although 70 pages long, the paper is definitely worth reading in full, as the literature shows a great deal of diversity, with broad findings nuanced and contextualised). For plantations/estates, the literature shows widespread evidence of low wages, long hours, poor housing and health risks for workers. Employment conditions are usually best for workers on permanent contracts. With the shift from salaries to piece work observed in recent decades, wives and children have been called upon to help men in the fields. Women are however frequently employed in their own right. Plantations can affect local food production by diverting labour from peasant agriculture and alienating land. It may help with workers’ incomes and wider food security if plantation employees are allowed to work on family farms at peak times, and if residential workers are granted farm plots on the plantation. Some people, including widows and single mothers, are drawn into plantation labour by poverty and landlessness. In other circumstances, plantation employment is more an opportunity to diversify income sources. Pre-existing poverty and inequalities in land ownership are likely to be exacerbated by plantations. These broad findings of course resonate with the Zimbabwe context, as shown by the work of Rene Loewenson, Blair Rutherford and others. The literature on contract farming asserts that participation in contract farming schemes provides a good earning, income stability and access to credit. Unfortunately such benefits often fail to reach the poorest farmers. There are typically barriers to entry, and agribusiness contractors have been known to tighten the terms of contracts or retreat to own-estate production over time. Two processes of socio-economic differentiation are associated with contract farming: differentiation between participants and non-participants; and differentiation among participants. The literature suggests that positive spill-overs from contract farming, such as technology transfer, can be inhibited by suppression of competition by the contracting firms. There is, however, better evidence for employment and spending linkages. Because deductions are taken from pay to cover advances, cases of indebtedness and exploitation have been reported, although results vary considerably. There can be tensions within the household if the new crop requires an adjustment in working patterns, and if the earnings are paid to a male household head to control. The risks posed by contract farming to food security within the household, and in the local area, can however be minimised by ensuring that some of the pay goes to women, controlling land conversion and introducing a crop that does not clash with the farming calendar, while supporting local food markets. Again, the general findings very much resonate with the Zimbabwe situation. Despite the current hype for contracting and outgrower arrangements, these certainly have their downsides. Although, some of the resettlement models (such as the A2 schemes in the sugar estates) are centred on outgrowing arrangements, many challenges have been faced. Large- and medium-scale farming areas create jobs for farm labourers. Some workers have been able to use their earnings to expand family holdings or set up their own operations. But in other cases workers are unable to accumulate enough savings or skills to get off the farm. Limited evidence was reviewed on conditions in commercial farming areas specifically, but generally speaking waged farm work is one of the worst paid, most hazardous and least protected of all livelihoods. As with plantations, commercial farms may have legal duties as employers of permanent staff but have increasingly transferred their workforce into casual or piece work. For female labourers, standards and conditions are generally low. Large-scale farms seem to create more local linkages than plantations. For example, there is a possibility that small farmers will adopt the crops introduced by commercial farming areas and that local agriculture will be stimulated, particularly if the commercial farmers or government introduce infrastructure. Many workers are allocated garden plots by their employers, who recognise that wages are below subsistence levels but resist increasing them. Again, the Zimbabwe parallels are clear. Until 2000, large-scale commercial farm areas certainly created employment, but exit was rare, and conditions poor. While linkages did exist, they were minimal because of the economic and geographic separation from small-scale farming areas. Smalley highlights three overall conclusions from her extensive review (again taken from the executive summary). The first is that although the record of plantation firms as employers has been criticised, the wages and conditions for workers can be better, or perhaps less bad, on foreign-owned plantations than on large farms and smallholdings. This should be borne in mind as we search for farming models that can benefit the rural poor. Before accepting the argument that contract farming, for instance, can reduce poverty because it involves poor smallholders hiring local labour, we should consider the wages and conditions that those hired labourers will face, as well as other dynamics that affect local labour patterns and entry barriers to participation. The second observation is that large-scale agriculture can affect women in many ways, good and bad. This deserves careful study, not only because women have proved to be especially vulnerable to a range of negative consequences from large-scale agriculture, but also because the gender related changes that occur within rural households lead, in turn, to changes in agricultural production and patterns of labour at the local level. The final theme to emerge is the instability of such commerical arrangements. Large-scale agricultural developments have proved vulnerable to competing land claims, internal financial and management pressures, labour unrest, external events and political opposition. Participants in contract farming schemes may exit while still under contract; farmers’ organisations may evolve into competitive rivals and migrant workers may return to farm at home. Smalley concludes “we need to think beyond simple models of dualistic African agricultural sectors, polarised into large-scale enterprises and smallholdings, and consider a diversity of social relations”. This review has much relevance therefore to contemporary Zimbabwe. Having moved from a dualistic system to a diversity of social relations underpinning a range of farm types, what types of commercial farming make most sense? Who wins and who loses? And what are the likely longer term impacts? Commercial farming, as the review confirms, has had a chequered and unstable history in Africa, and no one type can be seen to be most effective – either for commercial gain or from broader based growth and poverty reduction objectives. Most people agree (and I certainly do) that a mix for farm sizes/types makes most sense, but there are no easy solutions. Contract farming, and outgrower schemes, have been much touted as solution, but they have their own challenges. Equally the large estate model may offer a commercial solution, but they remain isolated from the wider economy, and labour always remains a challenge. In the new post-land reform agrarian landscape of Zimbabwe, there are a emerging ‘blocks’ of farms, associated with the A2 resettlements (and some A1 consolidated farms) that offer potential for commercial growth, but only if connected to smallholder areas to supply labour and offer markets. While we can agree that we must move beyond the dualistic mindset, the question of where to is less clear. This extensive review of past experience, however, can help inform this debate, and help avoid mistakes made elsewhere in the past. I wonder whether this is an accurate characterisation, or whether the writers at “IPS” were picking and choosing their soundbites. Your views are supplemented by none other than Eric Bloch. FOR the past five years, farmer Melusi Mhlanga has spent nearly US$200 each season, for inputs, but the maize yields have not matched his investment. “With good rains I have been able to get more than 20 bags from my two hectare field but now I barely manage 10 bags,” says Mhlanga, who spoke to IPS at his homestead in Nkayi where he has diversified into livestock breeding. Mhlanga operates a general store, a bottle store and a grinding mill, which he says are the new sources of income for him and his family since the maize failed. He now grows sorghum and millet for subsistence. Extension services, education and advisory services provided by local technical institutions, are critical in advising farmers on best agronomic practices to boost productivity and food security. Farmers like Mhlanga are potential role models under a well-funded agriculture sector. However, state investment in Zimbabwe’s agriculture has been hijacked by political priorities at the expense of long-term food and economic gains. Once the top contributor to GDP, farming is now second to mining. Tobacco is still the main agricultural export. At the core of Zimbabwe’s agriculture success is its main asset – land. Reforms availed more land to more people. But without investment, there is no cheap finance to buy equipment and inputs, and no adequately financed and resourced extension services. “Agriculture and land has become a political football between the main national parties, and with the donors,” Ian Scoones, an agricultural ecologist and professorial fellow at the Institute of Development Studies at the University of Sussex, UK who has extensively researched Zimbabwe’s agricultural sector, told IPS. 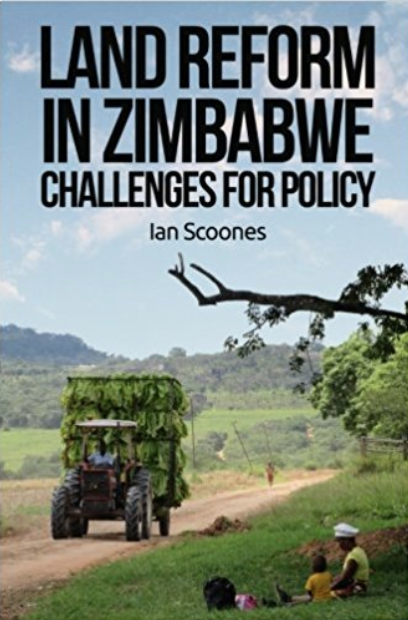 Scoones, co-author of the critically acclaimed book “Zimbabwe’s Land Reform: Myths and Realities”, explains that historically, Zimbabwe has invested massively in agriculture – in the pre-Independence period with the focus on building white commercial farming, and the period immediately post-Independence smallholder farmers in the communal areas. “Since 2000, the land reform programme took precedence, and, for a period, agricultural investment was run directly by the Reserve Bank of Zimbabwe,” said Scoones. Economic analyst Eric Bloch said Zimbabwe can restore its agricultural fortunes but first needs to tackle its external debt burden, convert current offer letters on land to transferable leases, and clarify the implementation of the Indigenisation Act, which is precluding potential investors. “We are in a food insecurity situation as we are still dependent on international food aid and maize imports,” Bloch told IPS. The World Food Programme estimates that up to 1.6 million Zimbabweans will need food aid after a poor harvest by smallholder farmers who contribute about 50 percent of the national maize crop. “The only times that the government has put a lot of resources into agriculture is during election years for obvious reasons,” agricultural economist and farmer Peter Gambara told IPS. Do you have any comment regards Anglo-Africans in the Save Valley Conservancy being banned from obtaining hunting permits (and thus their means-of-livelihood) despite being Zimbabwean citizens? As far as I can tell, there is some controversy over the issue (with Anglo-Africans rightly taking this to the UN), but ZanuPF hardliners maintain that only politically connected (non-white) persons can obtain permits, despite their lack of experience within the professional hunting industry. See WFP link posted by T Hodson earlier (http://www.wfp.org/countries/zimbabwe/overview). The WFP report gives the multiple reasons, including the fact that there was 19% less maize area planted than before. With the success of tobacco and cotton, this may be a longer term trend, requiring more imports in the future too. However we do have to be cautious about these aggregate figures, see my post on data. I wonder whether there is an intentional push toward tobacco farming and away from maize farming, as a neoliberal policy to keep the country dependent on food imports and produce cash crops for export. Clearly, it is much easier for farmers to get paid selling tobacco, than selling maize, for which they seem to take a long time to get paid. At the same time, isn’t it time that people moved away from maize as a staple crop, and toward more drought resistant and less input dependent crops like cassava, sweet potatoes, sorghum, which are often dismissively labeled ‘survival foods’. I don’t think there is any intentional push, it’s just that new farmers are looking for ways to make money – and tobacco and cotton, as you say, deliver. A shift to higher value crops is exactly what (white) commerical farmers did in the 1980s, and they produced less and less maize. Fortunately the communal area farmers post-Independence produced lots of maize, as small-scale agriculture was supported intensively by extension services, input supplies, credit and so on (see Carl Eicher and Mandi Rukuni on Zimbabwe’s maize revolution). I have no problem with farmers producing cash crops, as long as they can buy food cheaply on the market. However, if food is not grown locally then prices may be higher, and reliance on imports is always risky. A national food security policy is essential and supporting maize produciton must be part of this. But, as you say, there are other food crops, including small grains such as sorghum and millets. Indeed many farmers are producing these especially in the drier regions. These are never counted as part of national food balances, and overall production figures, which is why I believe the figures we get from FAO, WFP and others don’t always add up (see recent blog on data issues). Small grains are a mystery. Eicher says maize outperforms them in dry areas which is my own experience. However they are recommended for dry areas. Maybe it is when things are very dry. Planting packages based on a national database of soil type and region need to be developed. i.e. the right advice for where you are and the soil you have where you are i.e. a farmer. The man next door is in the same region but may have a different soil. It can make a big difference to what should be planted. Perhaps Melusi was trying to do too much by the look of things – running businesses and farming are difficult to manage together. But Nkayi was more or less a write of this year apart from the conservation farmers. I was in one of these fields and it was very impressive. He did get flown up to Harare to compete in the national prize, last year.